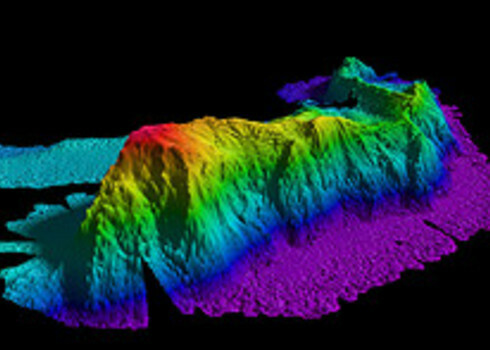 A large submarine isolated elevation, greater than 1000 m in relief above the sea floor. Seamounts are characteristically of volcanic origin and of conical form. Seamounts, or undersea mountains, are widespread and prominent topographical features of volcanic origin that rise up to heights of 1,000m or more from the ocean floor 1. The total number of seamounts remains unknown, but current estimates suggest numbers from 30,000 to 100,000 seamounts globally 2, 3. Seamounts are global in distribution. Satellite-derived information has been used to map them because of the effect they have on seawater height above and around them. Rock is denser than water and exerts a gravitational pull on the sea around it, making ‘mounds’ above the undersea mountain which are then measurable by satellite 4. Other mapping efforts have involved bathymetric surveys, numerical modelling and vessel track sounding data collection 5. Found in all oceans, seamounts can be associated with increased biological productivity, due to the upwelling of nutrients caused by currents and eddies near the surface of the structure 6. Moreover, their volcanic substrate can provide appropriate conditions for the development of epifaunal communities of sponges and cold-water corals 1, which together attract many open ocean and deep-sea species of fish, sharks, turtles, marine mammals and seabirds 6, 7. However, it should be recognised that seamounts vary substantially in terms of their physical structure 6 and their associated biological communities, particularly given their different sizes, summit depths, and distance from coastlines. There has been considerable debate in the scientific literature about the level of endemism and biodiversity associated with seamounts 8, 9, 10. Following a six year programme of study as part of the Census of Marine Life, the evidence collected suggested that, while seamounts do not always support high levels of endemism, they are potential hotspots of species richness and they support distinct communities. The study of seamounts has provided fascinating insights into tectonic plates and the movement in geological time of magma hotspots under the crust 4. In ecological terms, there is evidence that suggests that seamounts are hotspots of pelagic biodiversity in the open ocean, and have higher catch rates of some highly migratory species from longline fisheries, including Vulnerable species such as the shark shortfin mako (Isurus oxyrinchus) and the billfish blue marlin (Makaira nigricans) 7, 11. Fishing vessels are often active around seamounts because of the higher catch volumes associated with them, despite the risk of these becoming unsustainable in the long term (see Threats section). Seamounts may also provide refuge from habitat disruption due to climate change, specifically for the effects of ocean acidification 12. Their unique and isolated locations could give them a useful role as refuges from catastrophic environmental events and as stepping stone habitats for dispersal 10. Seamounts are known to be at elevated risk of fishing disturbance from bottom trawling 10. Fish often aggregate at seamounts, thereby facilitating high catch volumes. However, the fisheries based around these areas often target deep sea species, which are slow-growing, have low reproductive volumes and are long-lived (some individual fish have been aged at over 100 years old). Fish populations targeted around seamount are hence comparatively more vulnerable to overfishing. More widely, marine biological communities associated with seamounts are considered among the least resilient to disturbance 13. Another threat to seamounts may come from mining and extractive activities and carbon sequestration. Although these activities are currently at the exploration stages, their effects would need to be carefully monitored and managed to avoid or minimise long term impacts. Effects of disturbance could be physical, such as the creation of sediment plumes. In addition and because of the isolation of seamount communities, there is the possibility of causing the extinction of unique fauna through damaging only one location. These impacts are similar to that of fishing, and there is merit in management of both these potential threats 13. There has been no international assessment of the risk that seamount habitats are under. The considerable gaps in knowledge on these areas, because of the difficulty and expense of carrying out research in such an extreme environment, make it currently impossible to quantify the risks. However, it is clear that some fish species of commercial importance and which are found on seamounts are declining 14 and that following disturbance events, the recovery of fauna and habitat-forming species such as corals and sponges is slow or absent, making them very fragile systems 13. Rogers, A. D. The biology of seamounts. Adv. Mar. Biol. 30, 305–350 (1994). Wessel, P. Global distribution of seamounts inferred from gridded Geosat/ERS-1 altimetry. J. Geophys. Res. 106, 19431–19441 (2001). Yesson, C. et al. Global habitat suitability of cold-water octocorals. J. Biogeogr. 39, 1278–1292 (2012). Rogers, A. The biology, ecology and vulnerability of seamount communities. 12 pp. (International Union for Conservation of Nature and Natural Resources and British Antarctic Survey, 2004). Morato, T., Hoyle, S. D. S., Allain, V. & Nicol, S. J. Seamounts are hotspots of pelagic biodiversity in the open ocean. Proc. Natl. Acad. Sci. 107, 9707–9711 (2010). De Forges, B. R., Koslow, J. A. & Poore, G. C. Diversity and endemism of the benthic seamount fauna in the southwest Pacific. Nature 405, 944–7 (2000). McClain, C. R. Seamounts: identity crisis or split personality? J. Biogeogr. 34, 2001–2008 (2007). Tittensor, D. P., Baco, A. R., Hall-Spencer, J. M., Orr, J. C. & Rogers, A. D. Seamounts as refugia from ocean acidification for cold-water stony corals. Mar. Ecol. 31, 212–225 (2010). Clark, M. Are deepwater fisheries sustainable? — the example of orange roughy (Hoplostethus atlanticus) in New Zealand. Fish. Res. 51, 123–135 (2001).